Last month, Pastor Ray Hurt of the Princeton, West Virginia Church of God and his son, James, were the first to be honored with this initiative. 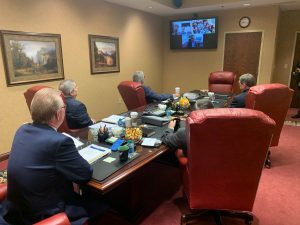 The two were phoned in to the March 5 meeting via Skype, where they interacted with members of the Executive Committee before offering a short devotion and invocation. On Tuesday, April 2, Rev. Mitchell Tolle and his son, Mitchell Tolle Jr., were guests during the Committee meeting. On March 17 a pastoral transition took place at the South Omaha Church of God that Marcia Stigile described in a Facebook post: “It was an honor to be at the South Omaha Church of God this morning for the passing of the mantle as the legacy continues to enlarge. Brad & Ashley Riddle received the passing of the mantle from his parents, Ron & Patty Riddle who have pastored this congregation for 26 years. 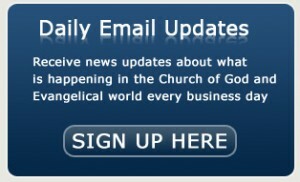 Prior to that, his dad, Ronald C. Riddle, pastored for 27 years. Brad & Ashley will be third generation lead pastors and Michael Stigile & I are excited to see the future unfold.” Michael Stigile serves as administrative bishop for the Midlands Region.